Born 1958, Melville Island, Tiwi Islands. Lives and works Milikapiti, Melville Island. Tiwi people. Country: Goose Creek, Melville Island. Skin group: Marntupuni (House Fly). Dance: Tarduwuli (Shark). 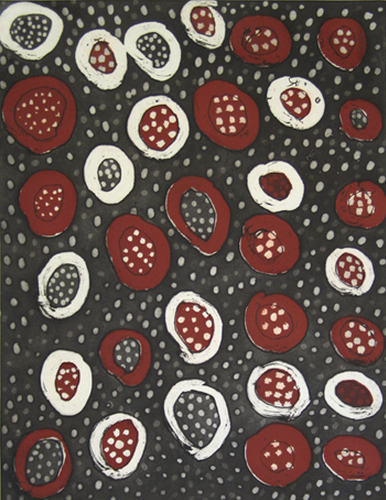 Timothy Cook was born in 1958 and lives and works at Milikapiti on Melville Island. A member of Jilamara Arts & Crafts Association, he began exhibiting his work in the late 1990s. 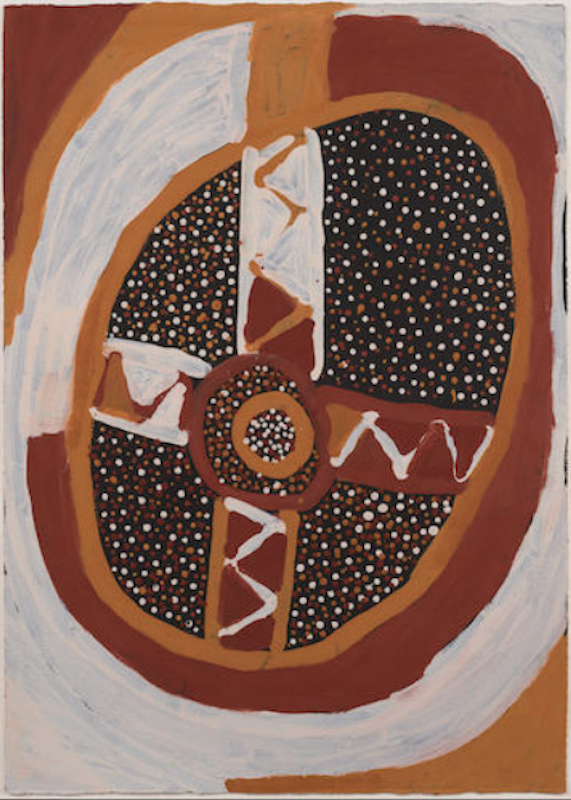 Featuring circular and cross motifs, Cook’s paintings are strongly connected to aspects of Tiwi ceremonial practice, particularly the Kulama (yam ceremony) and Pukumani (funeral ceremony), as well as stories of Purukapali, one of the great mythological Tiwi ancestral figures. Born 1958, Melville Island, Tiwi Islands. Lives and works Milikapiti, Melville Island. Tiwi people. Country: Goose Creek, Melville Island. Skin group: Marntupuni (House Fly). Dance: Tarduwuli (Shark). Timothy Cook was born in 1958 and lives and works at Milikapiti on Melville Island. A member of Jilamara Arts & Crafts Association, he began exhibiting his work in the late 1990s. 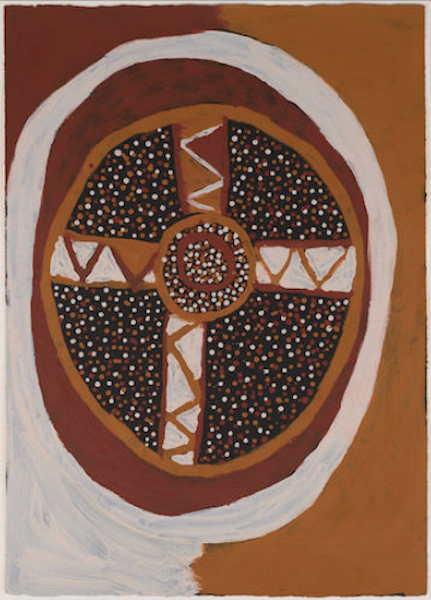 Featuring circular and cross motifs, Cook’s paintings are strongly connected to aspects of Tiwi ceremonial practice, particularly the Kulama (yam ceremony) and Pukumani (funeral ceremony), as well as stories of Purukapali, one of the great mythological Tiwi ancestral figures. Cook has exhibited widely in Australia and internationally. Recent solo exhibitions include Timothy Cook: Dancing With the Moon, Seva Frangos Art, Perth (2015); Timothy Cook, Seva Frangos Art, Perth (2013); Timothy Cook: New Works, Aboriginal & Pacific Art, Sydney (2012); Timothy Cook, Seva Frangos Art, Perth; and New Works by Timothy Cook, Aboriginal & Pacific Art, Sydney (2010). Recent group exhibitions include The World is Not a Foreign Land, Ian Potter Museum of Art, University of Melbourne, Melbourne (2014); My Country: Contemporary Art from Black Australia, Auckland Art Gallery Toi o Tāmaki, New Zealand (2014); My Country, I Still Call Australia Home: Contemporary Art from Black Australia, Gallery of Modern Art, Brisbane (2013); We are Tiwi, Harvey Art Projects, Ketchum, Idaho, USA (2013); Luminous World: Contemporary Art from the Wesfarmers Collection, Art Gallery of Western Australia, Perth (2012); 7th Asia Pacific Triennial of Contemporary Art, Queensland Art Gallery, Brisbane (2012); Parallel Collisions: 12th Adelaide Biennial of Australian Art, Art Gallery of South Australia, Adelaide (2012); and Almanac: The Gift of Ann Lewis AO, Museum of Contemporary Art, Sydney (2010). In 2012 Cook won the National Aboriginal and Torres Strait Islander Award and was a finalist in 2004, 2005, 2008, 2009, 2010 and 2011. He was a finalist in the Togart Contemporary Art Award, Darwin (2010 and 2013); Kate Challis RAKA Award, Ian Potter Museum of Art, University of Melbourne, Melbourne (2013); Western Australian Indigenous Art Awards, Art Gallery of Western Australia, Perth (2009 and 2011); Xstrata Coal Emerging Indigenous Art Award (2006); and the Shell Fremantle Print Award, Fremantle Arts Centre, Perth (2002). 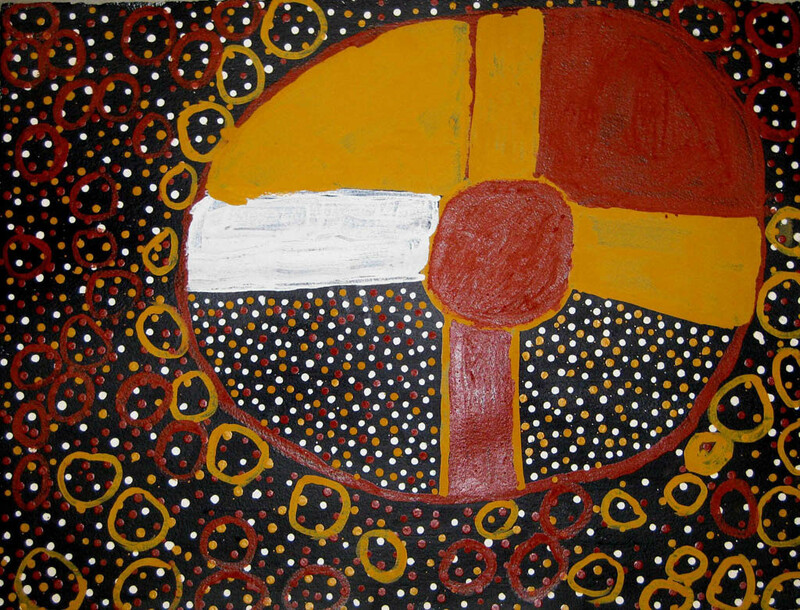 His paintings are represented in numerous major public and private collections in Australia and internationally including the Aboriginal Art Museum, Utrecht, Netherlands; Artbank, Sydney; Art Gallery of New South Wales, Sydney; Art Gallery of South Australia, Adelaide; Art Gallery of Western Australia, Perth; Charles Darwin University, Darwin; Corrigan Collection, Sydney; Laverty Collection, Sydney; Musée du Quai Branly, Paris; Museum and Art Gallery of the Northern Territory, Darwin; National Gallery of Victoria, Melbourne; National Gallery of Australia, Canberra; Parliament House Collection, Canberra; Queensland Art Gallery, Brisbane; and Wesfarmers Collection, Perth.